Cpl. Urban E. Johnson, son of Nora Lee Johnson, attended Frederick High School. Entered Marines in Nov., 1942, trained in Camp Elliott, Cal. 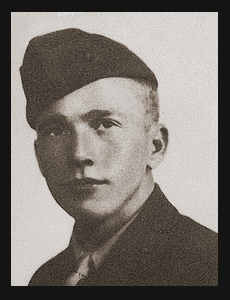 ; served in Australia, New Guinea, Cape Gloucester, Guadalcanal, Los Negros, and Okinawa; was wounded in action in Jan., 1944 in Cape Gloucester and in June, 1945 in Okinawa; is now on duty in San Diego, Cal. Awarded the Purple Heart with Oak Leaf Cluster, Pres. Unit Citation, Asiatic Pacific Ribbon with four Battle Stars.